Ricoh Calculator Makes Decisions Easy. Stephen Palmer production print director, Ricoh UK and IrelandIn a world where many printing businesses run a hybrid offset/digital production operation there can sometimes be an uncertainty about the most effective production technology to use. Ricoh is making these decisions easier with its Digital or Offset Calculator. This new tool, free and exclusive to all members of the Ricoh Business Driver Programme(tm), identifies which print production process is most appropriate for a particular job. Using the Digital or Offset Calculator, printers can ensure that their offset and digital presses are used in the optimal - and most profitable -way. The new tool was demonstrated for the first time during Hunkeler Innovationdays, Lucerne, Switzerland last week. "We are working all the time with combined offset/digital operations that are producing jobs in a wide range of run lengths," comments Stephen Palmer, production print director for Ricoh UK and Ireland. "For jobs at either end of the scale, the production technology decision can be obvious. However, there is an increasing grey area in the middle that this calculator addresses. This is driven by continual price/performance improvements in digital printing presses that extend the run lengths for which these presses are appropriate. The Digital or Offset Calculator provides printers with a fact-based methodology for making these important production decisions." 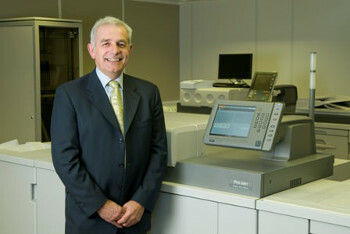 "We have been very pleased with the Ricoh Digital or Offset Calculator," said Aryen Pellikaan, Managing Director, De Hoop Grafisch Centrum, who was an early beta tester of the calculator in his print centre which runs three offset presses alongside its digital colour Ricoh Pro(tm) C901 Graphic Arts press. "We use it as a basis for jobs and that helps us improve our margins because we have a greater trust in the crossover period." Palmer adds: "This latest Calculator can also be used in conjunction with our Carbon Calculator to allow Ricoh customers to accurately assess and offset the carbon emissions generated by individual jobs. It is a part of our continuous research and development to help our customers improve profitability and sustainability, as well as to strengthen relationships with their clients by delivering more cost-effective and environmentally sustainable products." The Digital or Offset Calculator is the newest addition to Ricoh's Business Driver Programme, which Ricoh is continuously expanding. Other recent additions to the Programme include the Carbon Calculator, reports, videos and application guides.